The British Museum was constructed in the eighteenth century, is arranged as a quadrangle surrounding the Great Court, the centre piece of which is the historic Reading Room. 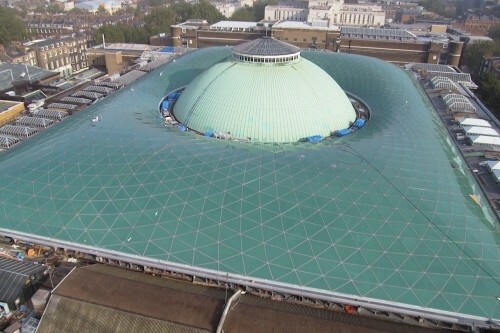 The Great Court is now being transformed by Lord Norman Foster into a new an spectacular public square covered by an elegant glazed roof the size of a foot ball pitch. 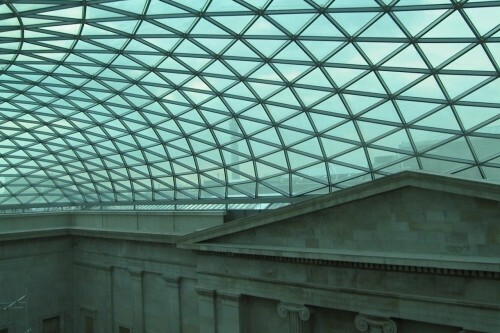 The roof covers the whole area of the Great Court with a length of 95m and a width of 74m and spans from the edge of the surrounding buildings to the Reading Room in the middle. The whole structure is formed by a net of triangular cells in a shell shape. Because the Reading Room is not exactly in the middle – it is slightly off towards the north – there is only one line of symmetry and therefore the geometry of all nodes and members is different. The final net is comprised of 4878 members and 1566 nodes within the net, all of them different from each other. Because the Reading Room cannot carry additional loads, 20 new composite columns are assembled in an even distribution around it and they sit on new foundations at ground level. On top of these columns there is a circular steel beam to which all incoming roof members are connected. The usual “arch effect” cannot be realised because of the sliding bearings, therefore the structure gets significant bending moments and shear forces in addition to normal forces. One of the main challenges, after understanding the geometrical and structural implications, was to develop a node detail which allows the connection of all members and transforms forces, and especially bending moments through the node. The various angles in between the incoming members, minimum 26 degrees maximum 110 degrees, and the fact that the members are twisted relatively to each other, had also to be taken into consideration. The latter is necessary because of the glass support directly on top of the upper flange. The node is cut out of a thick plate as a star with 6 legs, all of them perpendicular to the plate surface. The incoming members fit in between two legs and have to be prepared with a complex end treatment. To minimise on-site work, the feasibility of off-site pre-fabrication was investigated. Taking into account the maximum possible transport size, individual ladders were defined which were then pre-assembled and completely welded under workshop conditions. A total of 152 ladders was finally prefabricated and transported to site with more than 50 truck shipments. With this method, approximately 3,000 out of 4,878 members and all the 1,500 nodes were formed into elements and only the balance of the members was shipped loose to site. The roof is only stable once the entire steel is completed and therefore has to be supported temporarily during the entire installation process. To allow such a temporary support and at the same time to continue with some work underneath, a watertight working platform was installed at the snow gallery level. On top of this platform, a total number of approximately 600 props were set out to support the pre-fabricated ladders. After setting out the props, the ladders were lifted in and fine-tuned using the adjustable props. The next step was to fit in the loose members between the ladders, check the tolerances of these triangles and finally weld the connections. The de-propping could only start after the completion of the steel. The whole roof structure was built in a higher position using the “zero-geometry” to compensate the calculated deflection of the structure once it is set free and has to carry its load and that of the glass. The main purpose of the de-propping procedure was to lower the structure in a controlled manner and load it step by step. Because the maximum theoretical deflection is 142 mm, it was not possible to lower sections of the roof completely in one step without over-stressing parts of the structure. 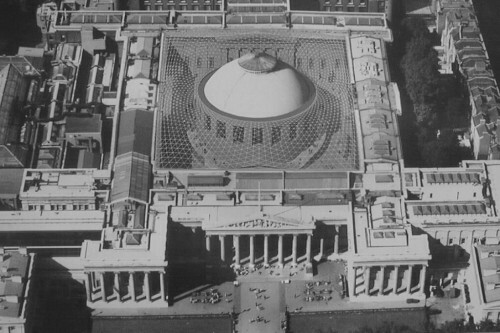 The roof area was divided into 12 zones, four diagonal ones, which are much stiffer compared with the rest of the structure, and two zones in front of each portico. The four phases and twelve zones together define 48 individual steps. Detailed calculations proved that after each of the steps no member or node connection was over-stressed. 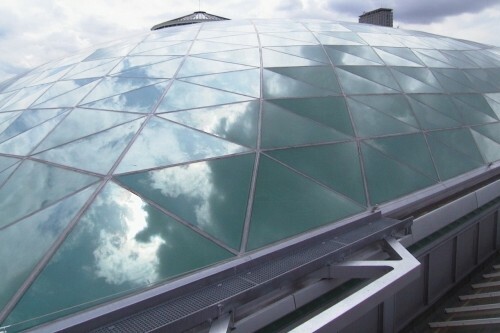 The roof glazing is comprised of 3312 glass panes, each a different size. They are supported directly by the main steel structure comprising a total area of 6.000 m². 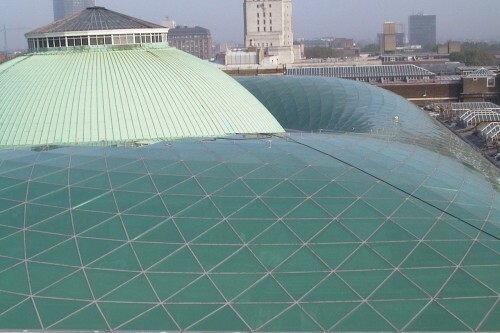 Because the Great Court is covered completely with the roof, high performance glass was required to ensure comfortable interior conditions throughout the year. This was achieved by using insulated glass units (IGU) with fully toughened 10 mm glass outside, an 16 mm air cavity and on the inside annealed laminated glass of 2 x 6 mm.